One of the main attractions that inspire application developers to write apps for Android, which the Samsung Galaxy S 5 uses, is that Google doesn’t have an onerous pre-approval process for a new app to be placed in the Play Store. This is unlike the Apple App Store or Microsoft Windows Phone Store, where each derivation of an app must be validated. Many developers prefer to avoid bureaucracy. At least in theory, this attracts more developers to do more stuff for Android phones. However, this approach does expose users like you to the potential for malware that can, inadvertently or intentionally, do things that are not advertised. Some of these “things” may be minor annoyances, or they could really mess up your phone (for openers). Market forces, in the form of negative feedback, are present to kill apps that are badly written or are meant to steal your private data. However, this informal safeguard works only after some poor soul has experienced problems — such as theft of personal information — and reported it. Rather than simply avoiding new apps, you can download apps designed to protect the information on your phone. These are available from many of the firms that make antivirus software for your PC. Importantly, many of these antivirus applications are free. If you want a nicer interface and some enhanced features, you can pay a few dollars, but this is not necessary. Examples include NG Mobile Security and Antivirus, Lookout Security and Antivirus, Kaspersky Mobile Security, and Norton Security Antivirus. If you have inadvertently downloaded an app that includes malicious software, these apps will stop that app. Another way to avoid malware is to download mobile software only from trustworthy websites. You can download Android apps for your phone from a number of other reputable sites, including PocketGear and MobiHand. Keep in mind that these stores are always on the lookout to withdraw applications that include malicious software. 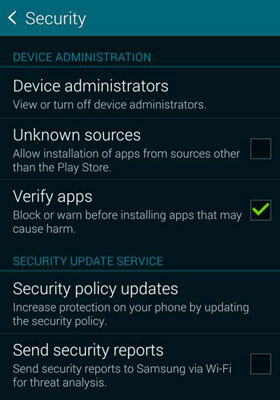 Google uses an internally developed solution they call Bouncer to check for malicious software and remove it from the Play Store. Other mobile software distribution companies have their own approaches to addressing this problem. The problem is that policing malicious software is a hit-or-miss proposition. As a rule, you should hesitate to download an Android application unless you know where it has been. You are safest if you restrict your app shopping to reputable companies. Be very skeptical of any other source of an Android application. That being said, there are many highly reputable stores. You aren’t limited to just the Google Play Store. You can enable downloading from sites other than the Google Play Store by checking the Unknown Sources checkbox under Security in the Settings folder.